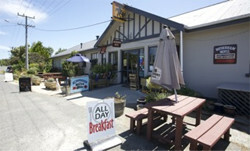 Longing for a weekend break in rural North Canterbury or following the Alpine Pacific Triangle? Are you a keen fisherman and want to go salmon or trout fishing in the Waiau or Hurunui rivers? Perhaps you're skiing at Mt Lyford? Or would like to book a function at our historical old stables Or simply want to break your journey to Hanmer Springs or Kaikoura? Then come in and enjoy our famous Rotherham Hotel meal or a Latte. Rotherham has a reputation for good quality food, try some of our famous Rotherham Hotel signature dishes: a T-Bone steak, yummy Honey Chicken Salad or to-die-for Blue Cod meal? Our Kitchen is open 7 days a week until 9PM. Please see our online menus. Rotherham has a variety of accommodation options, including 4 bedroom luxury house, Cosy 2 bedroom Cottage with sleep-out or one of our 7 Outdoor Cabins. Double and single rooms available, Full bathroom facilities, Lounge area; Laundry or Private living. Double rooms include television. Guest WIFI. Camping Available. The Rotherham warmly welcomes NZ Campervan Association Members.